This time I have chosen my preferred watercolour paper for Still life and Flowers. 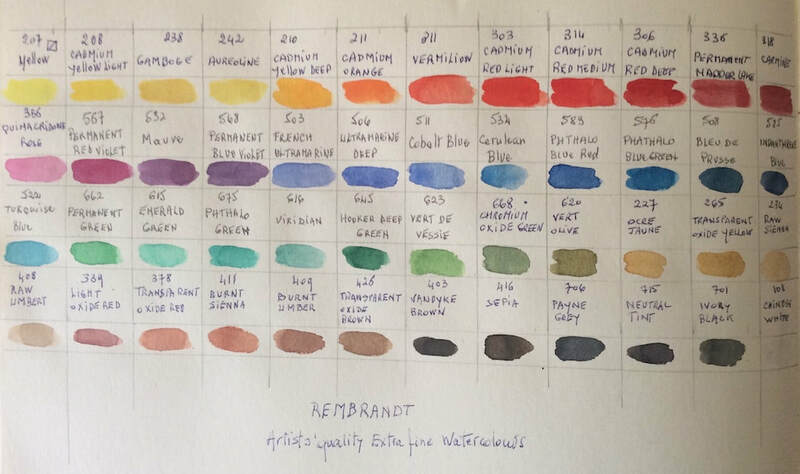 I have received a box of watercolour Rembrandt. I intend to use them for the whole painting. 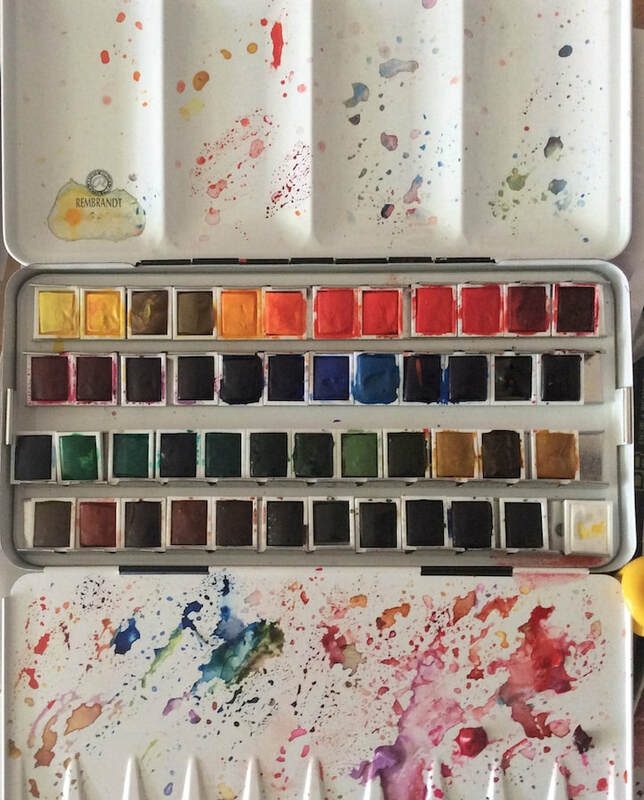 When I open a new box of watercolour paint, I remove the wrapper on each of the pan and write the reference number and the colour. There was not much choice at this time of the year but with all my references I could create a setting. 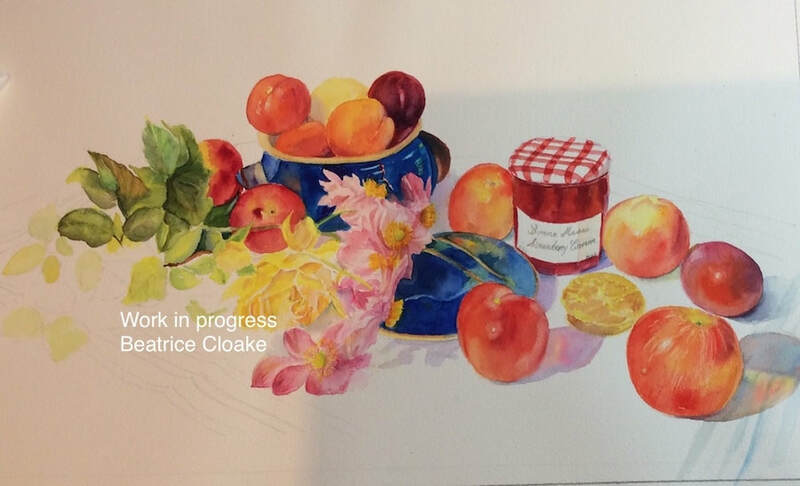 I have drawn very carefully fruits, the pot of jam that most people know, Japanese anemones and a yellow rose and bud. I am in search of strong colours and so I have to paint several layers. These Rembrandt paints are really lovely. I understand they were expensive but in my book, as I hardly need to take much on my brush, they are going to last a long time. One drawback. (All watercolours have one!) There is NO pink. So I need to use Opera Rose by Sennelier and Wisteria by Daniel Smith. I use very little masking fluid. As you can see, I have reinforced some of the colours! Very easy with Rembrandt watercolour. They are extremely vibrant. My worry was the writing on the pot of jam but I am satisfied with it. Now, I am complaining! out of all those gorgeous colours, there was no Pink. I know some artist dilute a Red paint with a lot of water to achieve Pink. and from Daniel Smith paint : Quinacridone Pink and Wisteria. This is to paint the Japanese anemones. I am using Masquepen as masking fluid. It is the most precise tool. I am now feeling confident about the outcome of the painting. It is always pretty daunting to put a demo online as things can go dreadfully wrong. 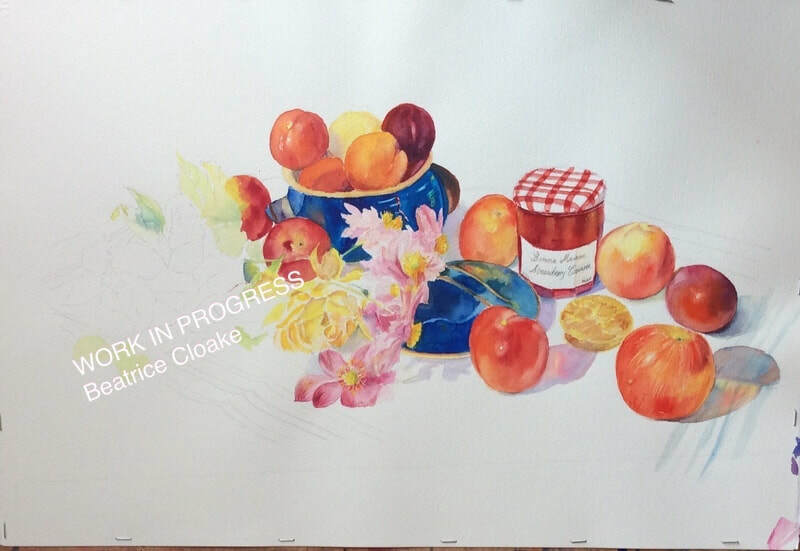 I have started to add layers after layers on the fruits in the bowl. I have worked too on the Japanese anemones. I still am in love with these vibrant colours by Rembrandt. 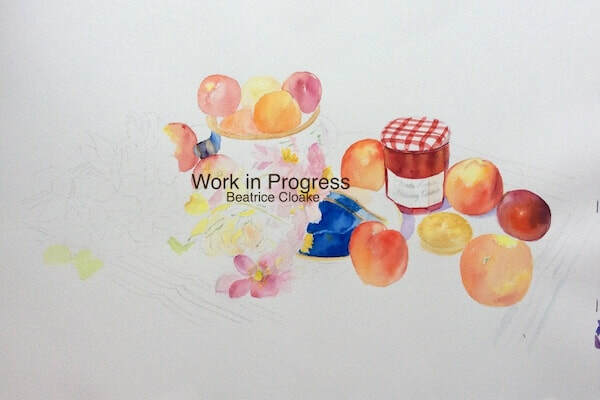 Still adding layers of colours, I was not satisfied with the label on the jam pot. It was not possible to erase the lower ligne without making a mess. So, I decided to change the lower margin of the label and it did work... phew! Notice how everything is now very vibrant! I definitely will be using these watercolours for still life painting. Landscape might be a challenge as I do not know them enough. I will give it a try. I have made my own on some leaves and used some green from the box to add them to the made colours.